See scan - absolutely perfect condition. 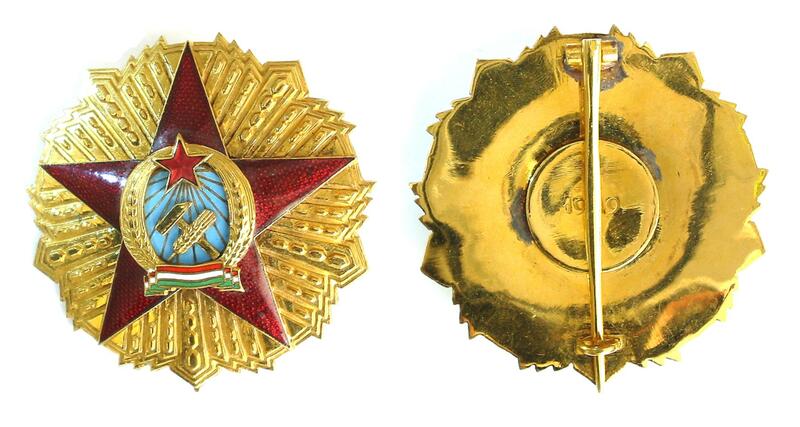 This is a nice and extremely rare earliest Communist era Hungary / Hungarian highest decoration - the 1st Class Gold star of the Order of Merit of the HPR (Hungarian Peoples Republic) and also known in Hungarian as Magyar Népköztársaság Érdemrendje. The star is a large gold / gilt metal decoration and the 1st Class is one piece award with star only. It also shows the pre-1957 version of the state emblem at obverse and has the date "1949" at the reverse. There is also some sort of maker's or manufacturer's mark applied near the base of the pin at the back of the star. The whole base of the star has a diameter of 70mm and perfect and intact enamel. The weight of the star is 78 grams. It was awarded to a top foreign official whose name we cannot share at the time being. LIFETIME GUARANTEED AUTHENTIC PIECE!!! We cannot find a single reference of a recent sale of this particular decoration and in general it is considered to be of highest collector importance. Scarce militaria / military collector piece and one of the rarest Hungarian orders and decorations.